This isn’t what Deontay Wilder had in mind when he agreed to fork over a six-figure step-aside fee to make sure he wouldn’t fight Bermane Stiverne. It’s not that he was worried about the challenge Stiverne presents. Far from it. Wilder, sick of all the criticism about his quality of opposition, wanted to silence the critics once and for all by taking on the one man no other heavyweight wanted to face. Unfortunately, banned substances were found in Luis Ortiz’ system during a Voluntary Anti-Doping Association drug test, and with it, the fight was cancelled. The WBC stepped in and enforced the mandatory with Stiverne, and now the two are set to rematch on November 4 in Brooklyn, New York. The whole reason Wilder (38-0, 37 knockouts) wished to fight someone else in the first place? 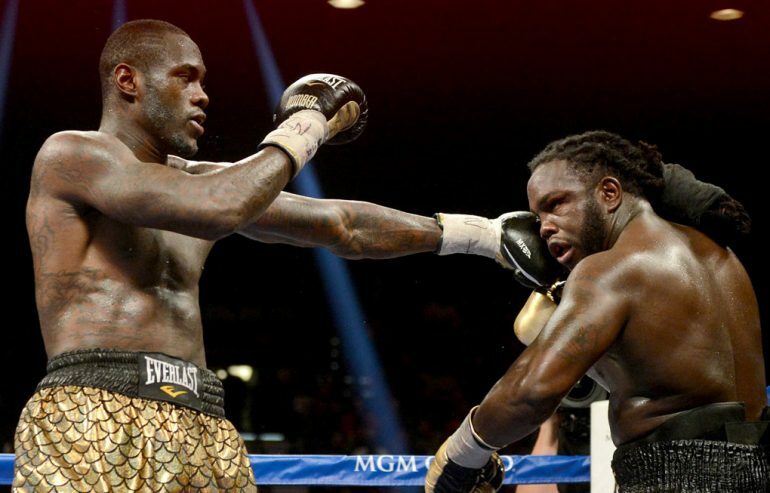 There’s little interest — from the public and television networks — in a second meeting between Wilder and Stiverne. Wilder lifted the WBC heavyweight title from Stiverne over 12 dull rounds, and the Haitian was never remotely in the fight. Stiverne blamed an illness, and remains the only fighter to ever last the distance with Wilder. That’s about the only intrigue heading into November 4: Can Wilder finish Stiverne this time and make it so he’s knocked out every man he’s ever faced? “Stiverne asked for it, so he’s going to get it,” said Wilder, who will make the sixth defense of his title. “Whatever happens happens. Ask and you shall receive. I’m relieved to be getting my mandatory out of the way. At least now I won’t have to deal with that down the road. Wilder, THE RING’s No. 2 heavyweight, actually bent the surgically placed metal rod in his hand during the bout. Fast forward two-and-a-half years later, and the fighters are in very different positions entering the ring. Now 31, Wilder is no longer a prospect jumping up in competition. He’s proven his world-class power, albeit against middling opponents. That’s not Wilder’s fault. He signed to fight Alexander Povetkin, a top-5 heavyweight at the time, who tested positive for PEDs. The Alabaman has screamed for a unification fight with Anthony Joshua. That will have to wait. For now, it’s Stiverne, who has competed only once since he lost his title. That performance did little to inspire any confidence Stiverne will have any more success this time around. Derric Rossy, a journeyman, dropped Stiverne, but was unable to finish him off and lost a close decision on the cards. Stiverne (25-2-1, 21 KOs) will be 39 when he enters the ring and also coming off a two-year layoff. Wilder is likely right: This probably isn’t going to end well for him. Wilder already feels a different kind of pain, though. The pain of criticism. The pain of working so hard for something, only to have it taken away. And Wilder wants Stiverne to feel his pain. This isn’t what Wilder had in mind. But it’s what he must deal with now.